Once object description has been transmitted to the viewing reference frame, we choose the window extends in viewing coordinates and selects the viewport limits in normalized coordinates. 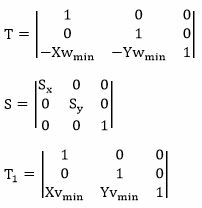 We do this thing using a transformation that maintains the same relative placement of an object in normalized space as they had in viewing coordinates. It will display at the center of the viewport. 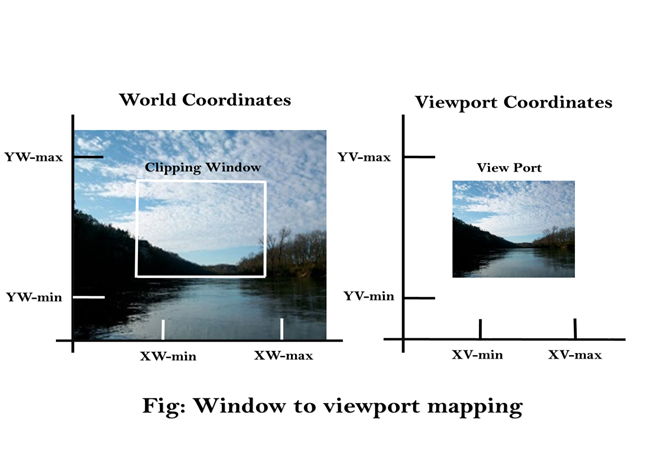 Fig shows the window to viewport mapping. A point at position (xw, yw) in window mapped into position (xv, yv) in the associated viewport. Perform a scaling transformation using a fixed point position (xwmin,ywmin) that scales the window area to the size of the viewport. Translate the scaled window area to the position of the viewport. Relative proportions of objects are maintained if the scaling factors are the same (sx=sy). From normalized coordinates, object descriptions are mapped to the various display devices. Any number of output devices can we open in a particular app, and three windows to viewport transformation can be performed for each open output device. This mapping called workstation transformation (It is accomplished by selecting a window area in normalized space and a viewport area in the coordinates of the display device). As in fig, workstation transformation to partition a view so that different parts of normalized space can be displayed on various output devices). Step3:Again translate viewport to its correct position on screen. We can display picture at device or display system according to our need and choice. World coordinate system is selected suits according to the application program. Screen coordinate system is chosen according to the need of design. Viewing transformation is selected as a bridge between the world and screen coordinate.